i've grown Matucana (syn Cupani) for years in my Allotment and veg patch at home. A jam jar of cut flower stems in the kitchen is fantastic for lifting your spirits as you prepare meals when you'd prefer to still be out planting a few more seeds. I've kept my own seeds for years as well, - and there's nothing better than growing from those little black balls you've kept in an envelope since last September. But this year, as I want to grow lots of Sweet peas, to be able to give the scent of summer with lots of my Bouquets, i've grown rather more than my usual couple of pots. In October I started off my normal Matucana, and some Blue Velvet, - which i'd grown at the allotment last year, and had a wonderful rich colour even though it flowered really late due to all the rain. These October sowings are now potted on,- they've not had any heat all winter, and have just been in my cold greenhouse. Some are in deep 1 litre pots, and some in a large container i'm going to make a wigwam over. Then, when I went to the lovely @Theflowerfarmer 's course in November- Georgie told me that Matucana doesn't produce long enough stems for bouquets. So I went straight to the Kings catalogue, and chose a whole load of other (new to me) varieties. - I'm really looking forward to seeing how the Beaujolais (burgundy), White Ensign (white) , Noel Sutton (sky blue) and Mrs R Bolton (pink) come out. These are now growing very healthily.But it's not enough, - I want more, - so i've now done another tray which include more Blue Velvet, Chatsworth (pale blue), and Midnight (purple red) The names are wonderful too! With a bit of Sunshine, these should be flowering in June (if my polytunnel planning permission comes through, it might even be sooner). Have I missed any I really should be growing? - What colours will I need to make fantastic scented bouquets this summer? Surrey Hills cut flower farm - 2 weeks in. Tomorrow, I will have had the keys to Hill Top Farm for 2 weeks. I always knew that it would be a physical start to creating a flower farm, and my body is telling me that i've worked hard over the last 14 days, - but the results are starting to show. There are 16 beds cut out of the field, to which we have added a thick layer of steaming organic compost to 6, and planted up 3. I'm obviously very pleased that he is keen to help, - He says he will be chief salesperson when we do farmers market in the Summer. I have had other help as well. Big thanks go to Ashley , Mum and Dad, and Paula, who have all shifted barrows of compost, and helped plant and pin down matting to create even more beds. As well as to all the others that have been kind enough to send me words of encouragement through Email, Facebook, Twitter, or by stopping me on the School run. Now i've got rid of Cornflowers, Calendula and Ammi from my Greenhouse, plus the patio is starting to empty of all my crates of bulbs. We've got these suspended at Hill top farm on a (hopefully) animal proof ladder across railings contraption. Now after a bath to wash off the mud, I can get out all the catalogues again, and do more planning of all the other stuff I want to get in the ground over the next few months. This week, - as well as creating a cut flower farm, i've had 2 projects, one to plant a Rose garden (which I will show you photos of in June) and one to tame a rather large Wisteria. Wisteria is an amazing, and rather large plant, as can be seen from this giant specimen I snapped with my phone in France last Easter. The wall is about 6 ft high and each of the flower racaemes are over 30cm long. To be able to produce flower like this, it needs to be encouraged to grow by regular twice a year pruning. The trouble is, that if you miss pruning for a year or 2, the growth becomes rampant, and it can twist itself around pipes, into guttering, and around itself. - Within a year this can become impossible to unentangle. My project earlier in the week, was one of those Wisteria. A lovely old specimen, but one which probably hadn't had detailed attention for a few years shown by the twirly stems that needed to be removed. January is the key time of year for retraining your Wisteria, and like most pruning projects, you need to look for Dead and Dying wood to remove, then crossing branches that can rub and damage each other, then look to open out the structure, and last shortening flowering shoots. Don's be afraid to take away plenty of plant material. This plant will actually thank me for taking out a huge pile of wood, especially as a lot of it was starting to rot. The windows won't be covered with tendrils this year, and the gutters won't get clogged with leaves. Plus it makes it easier for me to prune next year. Tomorrow's job is to help prune a standard Wisteria, - Can't wait until May to see the flowers. Garden gadgets, - Root trainers, worth it or not? Every year I try out new tools, gloves, gadgets and accessories. Some are a waste of time, (I had several pairs of gloves this year that lasted less than a week!) Some I rave about to all who listen (Anyone not heard me mention Felco Secateurs & Goat socks) and some I'm not sure about and need some persuading to use. One that falls into the last category, and that i'm now going to put in the rave section are root trainers. I'd heard Sarah Raven rave about these on a vegetable course that I went on 3 years ago, - and so i'd bought one. at £8.99 I wasn't convinced that they did that much more than deep pots, or toilet rolls, but as i'd paid so much for them i've used them each season, - mostly for peas and broad beans, - getting good results, but then broad beans are something that I usually have success with, even if just direct sown into the ground, so it wasn't a real test. - However this winter, they've really come into their own. After being fed up of not having Sweet peas until the week after our Garden Society's Summer Show, I decided to sow these in October this year. I sowed 2 seed into each module of sieved peat free compost in the middle of October and was delighted with the germination rates. - i've then pinched them back when 3 leaf pairs were showing. When I spotted roots escaping from the bottom during my weekly slug hunt, I decided to pot them up to the next size pot, to get them large enough to plant out in March. So yes,- not a cheap option when it comes to cell trays, but if you want healthy deep rooted Sweet peas, Root Trainers are worth looking into. So, - i've got my field, and this summer, I want to be bringing you photos of beds and bunches of flowers, but where to begin? In my own garden, I'm organic, and I really want this flower farm to be Chemical free. - That means that I won't be Glyphostating all the grass and weeds off. So this weekend, the physical task of taking off the turf and adding lots of organic matter has started. First thing this morning, there were 2 delivery drivers at the gate, - one with this load of 15 cubic metres of organic compost, and the other with our friend the turf cutter. Yesterday, -we'd done a soil test, from 3 different parts of the field, - the pH is very neutral, an average of 7.1. This will be fantastic for most cut flowers, but won't let me grow ericaceous plants like Azaleas and Rhododendrons. We also orientated were we were going to have the first set of beds, - taking into account the slope of the land, - where the sun rises and sets, and the drainage and shadow. The idea for the first of the beds (that are going to be for my over wintered hardy annuals) , is to take off the turf and then spread a good 10cm layer of the organic compost on top that i'll plant into. We'd dug the first metre of this bed by hand yesterday, to get an idea of the soil depth, structure and density. We were delighted with what we found. Because we are really lucky to have a crumbly well drained soil, there is no clay pan, which would stop plant roots going down into the top soil, so i'm not even going to bother rotavating these beds. now i'm off to put my feet up, - as we hope to do another 6 tomorrow. 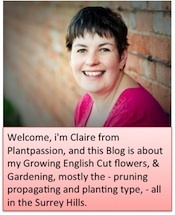 As 2013 dawns, I'm really excited to be able to let everyone know that Plantpassion is taking on a new challenge this year. I luurve creating flower filled borders for my clients, and keeping them maintained at high standards, but moving forward Plantpassion is going to be Gardening and Growing Cut flowers in the Surrey Hills. So here are my first photos of Hill top farm in East Clandon, which will be my base for this new venture. The Sign will have to change to something slighly more friendly, - but at least the Neighbours look interested enough, and hopefully they'll provide me with Manure for my flowers. Isn't the view amazing - that's Southwest London out there in the distance, - you can see the planes taking off from Heathrow on a clear day. So here before I get started i'd like to give some thank you's for those that have got me this far. To Mr Brunning and Su who made me jealous with their plans, and made me want to do something new. To Helen and Paula, who had to listen to me telling them about my dream continually while we were weeding. To my darling husband Ashley, who when I told him I had a mad idea, didn't laugh - just told me to do a business plan. Then actually made Excel work to give me figures. To all those people who've listened to me when i've asked "Have you got an acre of land to spare? ", and especially to Claire and Simon Owen, - who said, yes, we might be able to help. To all the people i've asked questions of through Twitter, Blogs and the Flower farmers google group, - especially @higgledygarden and @flowerona and @pepperpotherbs. Thanks for the fantastic flower farming /cut flower courses i've been on with Georgie Newbery - @theflowerfarmer, Arjun Heuse - @flowergroweruk and Sarah Raven @SRkitchengarden. I'm hoping some of what you've taught me will go in and stay in. I'm even going to say a brief thank you to the Guildford Borough planning department, who have let me know what I can (and can't!) do. So i'm ready to go, - after a couple of nail biting months, I've got keys and permissions. I'm really excited and also rather scared, - but i'm hoping that the residents of Clandon and Horsley will like having a Cut flower farm on their doorsteps. My dream is to create a Chemical Free, Sustainable flower farm, with Strong colour, Excellent Scent, and flowers all year round. Will I do it? - i'll keep you updated on here, and at my new facebook page - http://www.facebook.com/Plantpassion.